Discussion in 'News - Breaking News & Political Forum' started by nysister, Feb 8, 2019. Almost two years after the shocking discovery that people were being sold off at auctions in Libya, Canada has begun resettling hundreds of people rescued from slavery, according to a report from the National Post. The decision from our neighbors to the North comes amid United Nations leaders asking for the international community’s help with taking in Libyan refugees living in slavery. In addition to Libya, Canada has plans to take action on resettling at least 100 refugees from Niger who were rescued from Libyan migrant detention centers, including those who are victims of human smuggling, as reported in CBC. “It can take some time for the countries to do their selection because it was a voluntary act. So they want to screen. They go through their usual selection processes,” Michael Casasola, the head of resettlement for the UN High Commissioner for Refugees in Ottawa told the news outlet. Libya is known to be a major stopping point for asylum-seekers from Africa who are looking to cross the Mediterranean Sea to reach Europe. When a video released by CNN appeared to show a young black man being sold for $400 during an auction, it prompted world leaders from France, Germany, Chad, and Niger to implement a plan to evacuate the thousands of migrants stuck in Libyan detention camps. “As Canada takes more refugees, including Libyan refugees, it is important to remind other countries of their own commitments under the 1951 Refugee Convention and the need to respect the principle of responsibility sharing, which is one of the new norms of the refugee compact which Canada and other countries have just signed,” said Fen Hampson, the executive director of the Canadian-led World Refugee Council. Gin&Tonic, IslandMummy, RUBY and 4 others like this. But not the U.S. I guess they don’t want to import any more Black slaves..... just the folks from south of the border for farm work. curlvana and nysister like this. Might be better that they don't if they'd send them to the mid-west like they do the Somalis. That's a hard world for a Black person. curlvana, CarefreeinChicago and Rina88 like this. Why are the United States, Canada and Europe the only desirble places to be? It is the 21st century. There are so many people who are living in such deplorable circumstances who need to flee their homelands (Asia, Africa, Latin America), It does not make sense that after all these years, people are still suffering the same fates. Many of these places have the resources. I am sick of this chokehold on the lives of so many people. lavaflow99, curlvana, CarefreeinChicago and 3 others like this. A lot are and will be heading to China as well. The U.S. and Europe have rapedany of these places for their resources and your themselves as being the best places in the world to be. It makes sense that people woiwo want to go there, but I get what you're saying. CarefreeinChicago and Reinventing21 like this. ^^^ Oh yes, I get why people want/ need to come. I would too. I am just wishing for a different kind of world where third world countries were no longer Third World, and people had better options. larry3344, lavaflow99, curlvana and 5 others like this. Actually Uganda hosts the most refugees (per capita) in the world and Uganda is far from the richest country in the world. We are on Uganda’s northern border with South Sudan. A beautiful area with rolling green hills scattered with small villages comprised of mud huts, mango trees and compact cotton and tobacco fields. As Chief Adviser to the Education Commission, I am travelling with Save the Children UK’s team including its CEO, Kevin Watkins, on a joint mission to discuss schooling for South Sudanese children and youth seeking refuge in the north of Uganda. As we travel, the landscape gradually changes. The huts are replaced with small tent dwellings made from white plastic and emblazoned with the letters UNHCR. We have arrived at the Imvepi refugee settlement. A few miles further down the bumpy, laterite road, we reach the settlement’s reception centre. The first thing that strikes me is the sheer number of people. Today there are more than 10,000 people at the centre – individuals who have traversed the long road to Uganda from South Sudan. More than 3,000 people arrive every day. It takes a Herculean effort to keep up with the surge. This is because while neighbouring South Sudan gained independence in 2011, it did not gain peace. Today the country is faced with both conflict and famine and the immediate future is of grave concern. The UN has warned that the conflict could slide into genocide, while at the same time more than half the country now faces mass hunger. 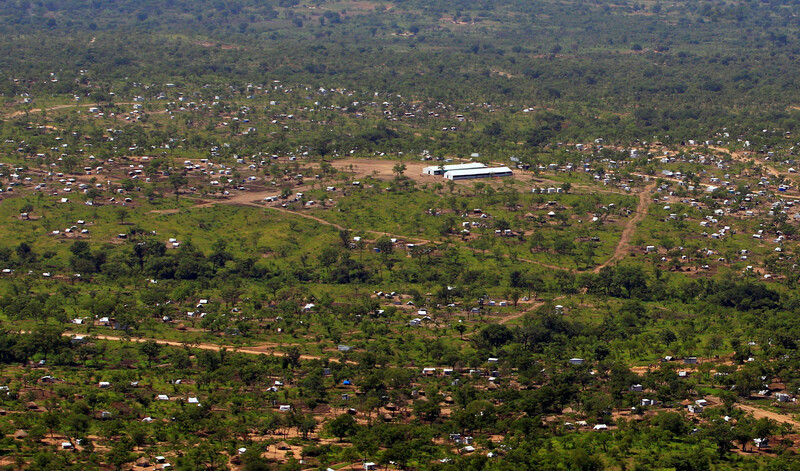 As a result, nearly one million South Sudanese refugees have entered Uganda. The sheer size of these numbers is difficult to comprehend. But what is clear is that this is one of the world’s biggest humanitarian crises. At the reception centre, I meet Rose*, 16, and her younger sister Victoria*. They have travelled from South Sudan on their own. “Walk straight down this road and eventually you will reach Uganda,” their parents told them. It took the sisters four days, and now they are sitting in the centre’s unaccompanied-minors section. Victoria tells me the schools are no longer functioning in South Sudan and she must continue her education. I have three daughters – I cannot imagine their parents’ pain in letting these two beautiful girls venture alone on that treacherous road to Uganda in search of hope in the form of an education. We move on to the Rhino Camp resettlement area, home to 86,000 people covering 10 square miles. I meet Anni* and her 12-year-old daughter, Sylvia*, who have been here since November 2016. They fled fighting in South Sudan. Sylvia is back in school as part of Save the Children’s accelerated learning programme at Ariwa school. Anni explains that her neighbours were captured and slaughtered as they slept. It took her five days to reach the border. It was then that her husband was killed in front of her. Anni says they wanted to kill her baby: “I told them, if now, if you want to kill my baby, it is better for you to kill me together. They got my baby and hung the baby facing down and they were holding a knife. I started calling Jesus name, be with me.” Her baby was spared. Determined to keep her daughter in school, Anni does not have the money to pay for the small fees: “The importance of education is that, if you are learned, the little information you got will empower the child to be independent, to be self-reliant, to be able to handle issues and to be able to sit well with others.” Anni adds that if children do not go to school “… they will be like town dogs who roam”. The next day we visit another settlement, Bidi Bidi, the largest in the world with around 270,000 people. Here I meet David*, a budding scientist and top of his class in South Sudan. He is sitting at the back of the class quietly reading his book when I approach him. I ask if I can look through his large blue hardback exercise book. His face lights up. He shows me with pride the work he had been doing at school in South Sudan. “I want to be a scientist,” he explains to me. 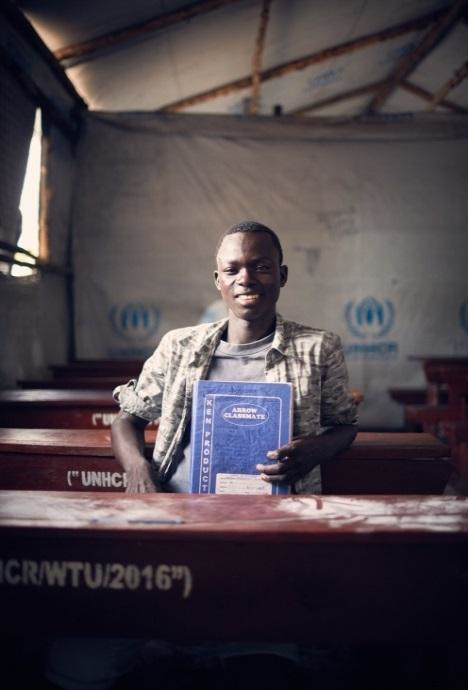 On that long journey from South Sudan, most people brought nothing but themselves; David clung to his book and a desire to learn in school. During our time in Uganda, we meet many more refugees. Their stories are disturbing, journeys horrific, and futures unknown. But coursing through the settlements and country is something not seen, but rather felt: Uganda’s compassion and empathy towards the South Sudanese refugees. In a world where refugees are increasingly vilified and in a region under great stress, this compassion and empathy is both humbling and uplifting. Uganda’s work with refugees in partnership with humanitarian organizations, such as Save the Children, is of great importance. Save the Children and the Education Commission are working together to bridge the gap between short-term humanitarian responses and longer-term development in education. The Commission’s Pioneer Country Initiative was launched in Uganda late last year when a delegation headed by former President of Tanzania, Jakaya Kikwete, met with Uganda’s President Yoweri Museveni. Save the Children is now providing emergency schooling to refugees across Uganda, top up classes for those who have fallen behind, and play camps that help children recover from their trauma. Northern Ugandans have their own history of being uprooted and displaced. Even as recently as 2003-2012, 95% of the population – some 1.8 million people – were internally displaced. Throughout our delegation trip, we come face to face with the expression of Ugandan compassion and empathy. From the teacher at Kiranga primary school, a doctor at Ariwa health centre and the government official in Arua, to the minister of education and the minister of finance – the list goes on. This deeply felt compassion has resulted in an incredibly progressive policy towards refugees, one of the best in the world. thefineprint, curlvana, nubiangoddess3 and 6 others like this. Cause the UK pillaged most of these countries blind and then the US joined. Europe enjoys taking natural resources for themselves and leaving nothing for residents. I don’t feel sorry for any imperialist nation. kblc06, Peppermynt, curlvana and 4 others like this. Plus Canada is still underpopulated lol. curlvana and LaFaraona like this.